The first lap of the MotoGP round at Mugello had the crowds going eerily silent. Why? Because on that first lap, home hero Valentino Rossi crashed out of the race after an on-track tussle with Alvaro Bautista. It appeared that Bautista had simply not seen Rossi, swiping him, and resulting in the both of them ending up in the tyre barriers. Simply put, it was race over for the both of them, as Jorge Lorenzo swept into the lead of the race at Mugello. It wasn't to be an entirely calm race for Lorenzo, though. Even though he'd managed to get his way past pole-sitter Dani Pedrosa, the Repsol Honda rider was still chasing him down and trying as best as he could to get alongside the lead Yamaha. Pedrosa had reason to be concerned as well. Catching him quickly was his own team-mate, Marc Marquez. The young Spaniard was determined to get alongside Dani and take position from him. After all, he's managed to get on the podium in every race in 2013, despite the fact that it is his debut season in the premier class of Grand Prix motorcycle racing. Picking up Pedrosa, then, was just another step up on the rostrum. And that's precisely what happened, as he sailed past Dani to take second spot. That dispensed with, Marquez started chasing down the Lorenzo, while Cal Crutchlow on the Tech3 Yamaha was in fourth, chasing the pack. Then it happened. With three laps to go, and the chequered flag nearly in sight, Marquez crashed out, ending up in the gravel trap. Of course, he couldn't hide his disappointment and looked heavenwards, waving his arms and stomping his feet, as the Honda team quickly scrambled to get him his favourite blankie and a pacifier to go with it. On track though, it was Crutchlow's turn to make it onto the podium, which is what he did. 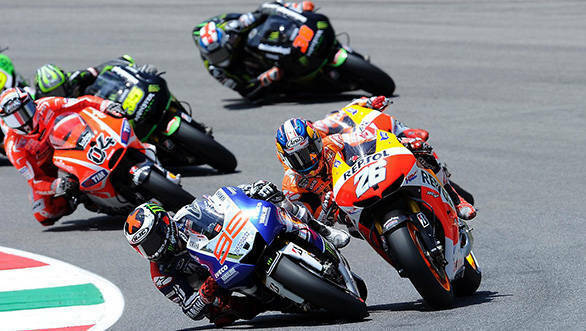 Lorenzo took first, Pedrosa finished second and Crutchlow finished in third spot. But even as the three riders got onto the rostrum for the customary celebration, the Italian fans chanted for the one man that they'd gone there to watch - 'Vale, Vale, Vale' the grandstands reverberated. Vale, however, with his DNF is currently sixth in the championship standings, with 47 points. At the head of the order, Dani Pedrosa heads the standings with 107 points, with Jorge Lorenzo second with 91 points and Marquez third with 77 points. Catching up to them, is Crutchlow with 71 points. The Moto2 race was won by Scott Redding. But it's the Moto3 races that we're more concerned with, of course, because of Mahindra Racing. The race at Mugello was of particular interest to Indian fans. Starting from the second row of the grid, Miguel Oliveira was up into ninth as soon as the race started. Within a few laps, he was up into third place, battling with the leading group. Getting into third was a memorable outing though, with Oliveira setting fastest lap along the way. The top five riders managed to grapple with each other, the lead changing hands on several occasions. As the chequered flag fell, however, Luis Salom took victory, chased closely by Alex Rins and Maverick Vinales. Oliveira was just a whisker away from them, narrowly missing out on the podium, a fact that he stated he was "a little disappointed with". Mahindra Racing is now third in the Constructors Championship, and the team is gunning for the podium as their next target. Onto Catalunya then!